Daratumumab (D), a human anti-CD38 IgGκ monoclonal antibody, induces deep and durable responses with a favorable safety profile in patients with relapsed or refractory multiple myeloma (RRMM). We report a pre-specified interim analysis of the first randomised controlled study of daratumumab (CASTOR; NCT02136134). To compare the efficacy and safety of daratumumab plus bortezomib (V) and dexamethasone (d) versus Vd alone in patients with RRMM in a phase 3 study. Patients who received ≥1 prior line of therapy were randomised (1:1) to 8 cycles (q3w) of Vd (bortezomib: 1.3 mg/m2 subcutaneously on Days 1, 4, 8, 11; dexamethasone: 20 mg orally on Days 1, 2, 4, 5, 8, 9, 11, 12) with or without daratumumab (16 mg/kg intravenously qw in Cycles 1-3, Day 1 of Cycles 4-8, then q4w until progression). The primary endpoint was progression-free survival (PFS). 498 patients (DVd, 251; Vd, 247) were randomised. Baseline demographics and disease characteristics were well balanced. Patients received a median of 2 prior lines of therapy (range 1-10). 66% received prior bortezomib; 76% received prior immunomodulatory drug (IMiD); 48% received prior proteasome inhibitor (PI) and IMiD; 33% were IMiD-refractory; and 32% were refractory to last line of prior therapy. 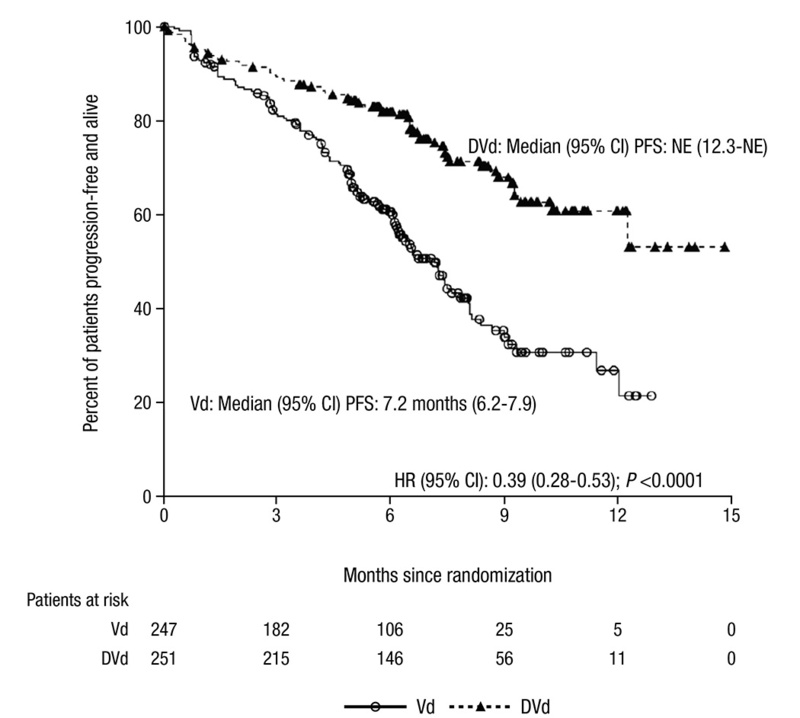 With a median follow-up of 7.4 months, daratumumab significantly improved median PFS (61% reduction in the risk of progression/death) for DVd versus Vd (Figure). Addition of daratumumab to Vd also significantly delayed median time to disease progression (TTP) versus Vd (not reached [NR] vs 7.3 mo; hazard ratio, 0.30; 95% confidence interval, 0.21-0.43; P <0.0001). Daratumumab significantly increased overall response rate (ORR; 83% vs 63%, P <0.0001), in addition to doubling the rates of very good partial responses (VGPR) or better (59% vs 29%, P <0.0001) and complete responses (CR) or better (19% vs 9%, P = 0.0012) for DVd versus Vd, respectively. The median duration of response was NR for DVd versus 7.9 months for Vd. All planned sensitivity analyses demonstrated that DVd was better than Vd, which was consistent with the results from the primary analysis. In addition, pre-specified subgroup analyses on PFS demonstrated that the treatment effect of DVd over Vd was consistent across all selected subgroups. Most common (>25%) treatment-emergent adverse events (TEAEs; DVd/Vd) were thrombocytopenia (59%/44%), peripheral sensory neuropathy (47%/ 38%), diarrhoea (32%/22%) and anaemia (26%/31%). Most common grade 3/4 TEAEs (>10%) were thrombocytopenia (45%/33%), anaemia (14%/16%), neutropenia (13%/4%). 7%/9% (DVd/Vd) of patients discontinued due to a TEAE. Daratumumab-associated infusion-related reactions (IRR; 45% of patients) mostly occurred during the first infusion (98% of patients with IRR); most were grade 1/2 (grade 3/4, 9%/0%). Daratumumab significantly improved PFS, TTP, and ORR in combination with Vd versus Vd alone. DVd doubled rates of both VGPR or better and stringent CR/CR versus Vd alone. Safety of DVd is consistent with the known safety profile of daratumumab and Vd. The addition of daratumumab to Vd should be considered a new standard of care for patients with RRMM currently receiving Vd alone.